Home | Blog | Ask Our Experts: Is HVAC Preventive Maintenance Really Worth the Money? Ask Our Experts: Is HVAC Preventive Maintenance Really Worth the Money? Much like your car or your body, an ounce of prevention is worth a pound of cure when it comes to your HVAC systems. Read on to find out why affordable preventive maintenance programs, like those offered by Tuckey Mechanical Services, often turn out to be “worth their weight in gold”! Yes, preventive maintenance really is worth the money. Think of your HVAC equipment like you think of your car – if it gets regular tune-ups, emergency breakdowns are avoided and the life of the equipment is extended, saving you lots of money in the long-run. What’s more, Tuckey preventive maintenance programs are very reasonably priced and provide additional benefits for customers, including a waived show-up fee for visits, discounted pricing on parts, and priority scheduling for all service calls. It truly does pay to be a Tuckey preventive maintenance customer! The question of whether preventive maintenance plans for heating, ventilation, and air conditioning (HVAC) equipment is really worth the money is one that we often hear from those wishing to save money on their home or office mechanical systems. We strongly advise our customers to sign-up for preventive maintenance plans because, in the long run, it is less expensive to maintain your mechanical equipment on a consistent basis than to wait until it breaks down and be stuck with a large repair bill. An analogy is appropriate in this regard: you should treat your HVAC equipment like your automobile, not like your refrigerator. What do we mean by this? Well, most people buy a refrigerator, operate it for many years until it breaks, and then buy a new refrigerator. This plan typically works well because refrigerators are fairly simple systems and their replacement cost is relatively inexpensive (especially if the refrigerator lasts many, many years). Compare this with the way you approach your automobile: most people do not purchase a car, operate it for many years with no maintenance (no oil change, tire rotation, filter change, etc) until it breaks, and they buy a brand new car. This doesn’t make sense because a car’s internal workings are relatively complicated and require consistent maintenance in order to last longer and perform well over the car’s entire lifespan. Your heating, ventilation, and air conditioning equipment is like your car. Its inner workings are relatively complicated. These parts need to be taken care of (inspected, lubricated, replaced, tuned-up) on a regular basis in order to avoid sudden breakdown and to make sure that the equipment lasts as long as it possibly can. In the long-run, it is much less expensive to maintain your automobile and HVAC equipment on a regular basis than to wait until they break down and purchase a new automobile or HVAC system more frequently than you’d like! 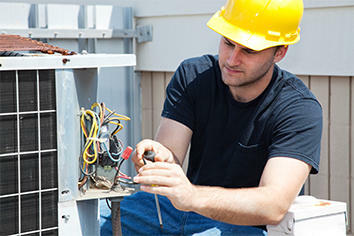 Services may be performed once or twice a year (if twice, typically once in the spring and once in the fall). Pricing is subject to change but generally ranges anywhere from $30 to $240 per visit per unit (depending on type of equipment being maintained), which is very reasonable when one considers the very high cost (can soar into thousands of dollars) of emergency repairs for a broken unit or replacement costs for a new unit. In addition to equipment preventive maintenance contracts, the Tuckey Companies offer complete home maintenance programs, which include gutters and spouting maintenance, duct cleaning, general maintenance and repairs, and much more in addition to HVAC preventive maintenance as described above. These programs are customized and priced to each customer’s unique needs – we intend to be your one-stop-shop for home and office HVAC, electrical, plumbing, restoration, and remodeling needs! In short, it pays to have a preventive maintenance or whole-home maintenance program with the Tuckey Companies! To learn more, visit our website at https://www.tuckey.com/preventive_maintenance.html. To request further program information or sign-up for a PM agreement, contact us at (717) 524-1136 or info@tuckey.com.